We moved out of the hotel yesterday and into our new (to us) home. We only have two folding chairs and a mattress, but it's wonderful to finally be in our own place. The rest of our stuff should get here by the end of the week. I'm curious about the original owners and hope to figure out who they were. I look out the windows sometimes and imagine a family living here and can't help but wonder what the woman was thinking when she stood in the same spot or how many kids lived here. One of the bathrooms is from 1930 -- only the sink and toilet, and some overhead lights, have been updated. We suspect that it was the only bath when the house was built. If it wasn't original to the house it would be gone! But, given that someone laid those frightful pink, almost purple, and green tiles 88 years ago, we will preserve it. On the other hand, I love those built in cabinets. And here's a picture of what will be my craft room. (It's much smaller than this realtor picture makes it look!) It used to be what we think was the master bedroom for the house, but a previous owner turned it into a family room and added those built in cabinets. There's room for a couple of chairs and a TV, so Mike can join me sometimes while I craft. (If you look closely, you can see the original wood telephone stand in the hall and the wrap around sunporch outside the craft room window.) I cannot wait to fill up those shelves with my supplies! Here is the front of the house. Those windows on the left enclose a sunporch. It used to be an open porch, but the previous owner installed windows and screens and it is now one of my favorite spots in the house. This house sat on the market for quite a few months. As a result, the price kept dropping, and, because it needs a fair amount of work, we were able to factor that into the final price. I am so grateful to be living here. Nevertheless, it's been a somewhat difficult transition. I just miss what I still refer to as "home." We see our son and Mike's brother's family almost every weekend and then I'm happy, but 24 hours later I'm homesick and missing my home and friends. The good news is that I'm confident that, once our stuff gets here, and we can make this place a home, I'll be feeling much better. I'll let you know when our my stamping stuff arrives! Oh but the joy of having a completely clean space to fill up (or not) and organize would be delightful. Looking forward to the next update. thanks! I got rid of some stuff, but not much, and the reality is that this built in is not enough space. yikes. so I'll add a rolling cart and a table and pack away some stuff and rotate as needed! It's absolutely beautiful inside and out. The architecture, the space, the lawn -- lovely. It's all a lot of work, but filling it with your things will be fun. You'll be too busy for a while to think much about your previous home. Later you'll have your stamp room set up. I'd welcome more pictures of the whole place anytime you're ready. Congratulations on your new home, Joan! 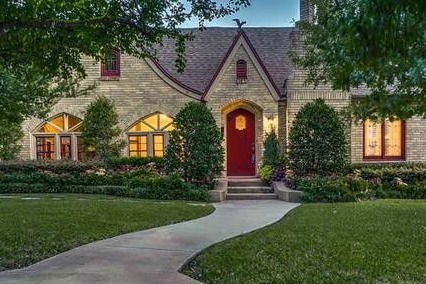 what a charming home, Joan - it's just beautiful and will be a "real" home to you soon. have my tickets to dallas so hope we can meet and have coffee while i'm there. What an absolutely beautiful home! Thank you for showing us! I've been checking your blog every day in hopes you would! When we first moved to our present house, we had only two folding chairs, a folding table, and a mattress on the floor. I rather liked it! I liked all that space, with no junk! thank you. our stuff has arrived and we are busy unpacking. this is going to take a while! no, that pink is quite bright -- almost a purple. !!! What a fabulous house! You and Mike will make it feel like home I just know that to be true... though I do know exactly how you feel, Joan, so I won't make light of your feelings, and missing your friends, and the sense of home. I met a wonderful gal from Dallas one Summer at a craft fair where I sold my cards. She would stop by my home to buy cards when she was in Michigan visiting her Mom. I'm betting she'd love your darling creations, too! Did you move any? The house is just beautiful!!! 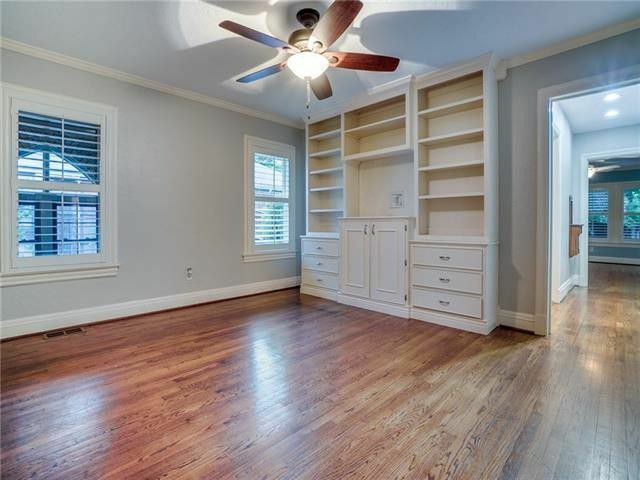 I love the front, the craft room, the porch...all of it! So much charm and character. And I’m so happy you are in it! You will be feeling much more at home when your things come. It will be so fun to arrange all the rooms, and finally have your own bed to sleep in! I’m very excited for you and this new transition to your life. I am just sure you are going to be glad you are there. No one 0n earth is more wonderful than family, and you will love being closer to them. Your friends can come visit!! Take care, and I hope this week passes quickly for you. Joan, your new home is beautiful! I love the architecture and lines of the front of the house. Your craft room looks like it will be wonderful. And the bathroom, the pinky purple tiles are definitely interesting. Will you keep those? I think the color and style are coming back in style.i know everything seems so overwhelming right now but take it slow and enjoy your self while you make this home your own. we'll keep that bathroom because it is original. the floor looks quite dull. the formerly white tiles look almost brown. i think I'll have it steamed clean and see if I can at least make it look clean! Congratulations to be in your new home. It looks very grand, and is it made of sandstone? 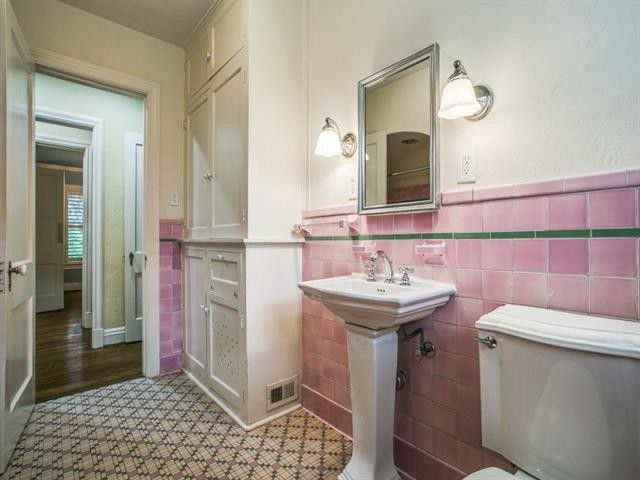 I have to say I love the wall tiles in the bathroom, I imagine the pink is quite overpowering but it is very in keeping with the age of the house. It looks to be in great condition, hope the work is all minor that you have to do and hope you stop feeling homesick soon. the house is a pale whitish gold brick. the house has a variety of issues. none of them appear (yet) to be overwhelming but it is a long list! Congrats on moving into your new home! It looks lovely, but that pink.....I'm sure the original owner will forgive you! I hope you enjoy the fun times converting it into exactly what you want. we will leave that pink bathroom alone. it works and is a conversation piece. people either love it or hate it! !